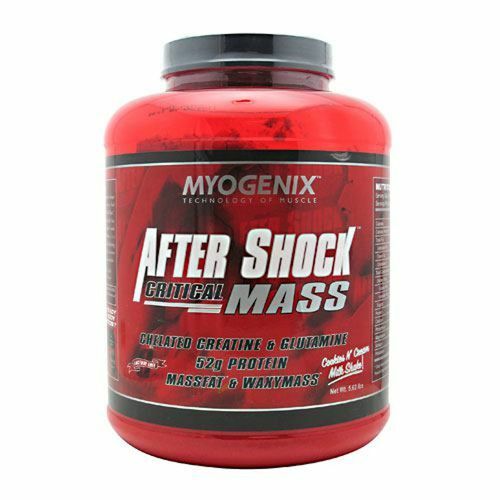 Pack on weight and quality muscle with AfterShock Critical Mass from Myogenix. With 700 calories, this supplement works to promote healthy mass gain and help you to acquire the body you've always wanted. AfterShock Critical Mass from Myogenix can provide your body with essential nutrients like fiber, protein, calcium, phosphorous and magnesium to contribute multiple health benefits. By propelling your body into anabolism, this supplement can help you to quickly pack on slabs of dense, powerful muscle and help you to obtain the gains you desire. AfterShock Critical Mass from Myogenix can give your body the boost of muscle-building power it needs. Get it today at eVitamins for a great price! Warnings: This product contains ingredients derived from milk and soy. This product is manufactured in a plant that processes milk, soy, wheat & eggs. Recommended Use: Mix 1 serving (170 g / 3 level scoops) in approximately 16 oz of water and consume up to 3 times a day. For additional calories, add fresh fruit, peanut butter, whole milk, cooked oatmeal or cream and mix in a blender. Enjoy!